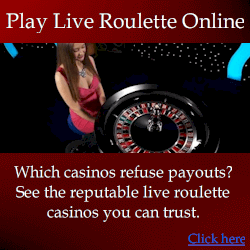 We are part of the roulette wheel analysis group, and the Site Promotions PTY LTD corporation. Our other web sites include genuinewinner.com, roulettecomputers.com and blackjackcomputers.com. Our company was established in 1999, although we have been developing methods to beat roulette for approximately 15 years. Additional to our genuine winner roulette system that teaches players how to win at roulette without electronics, we have developed what we know to be by far the most sophisticated and effective roulette computers available anywhere. Our group consists of a varied group of individuals, some of which were previously employed by casinos to detect professional players. www.genuinewinner.com: winning casino roulette strategy to beat casinos without cheating devices. Legal in all jurisdictions, although not “welcome” in casinos because the techniques are effective. www.roulettecomputers.com: Standard roulette computer device. Instead of using image recognition systems to establish wheel and ball speeds, it uses manual clicks of a button by the operator. While this is acceptable, and the device’s algorithms and overall design minimizes errors from the manual timings, it requires the operator to look at the wheel – this is not as covert as the Hybrid as the Hybrid does not require players to look at anything but the betting table. www.hybridroulettecomputer.com: The hybrid is unlike any other casino cheating technology, and is the device explained in this web site. It is not exactly a roulette strategy, it is a cheating device. www.blackjackcomputer.com: The CCSA (Card Counting Shuffle Analysis) blackjack computer is a device that does exactly what the name suggests: card counting and shuffle analysis. It tracks individual cards, and analyzes shuffles from the casino’s shuffle machine. This allows the device to predict which card will be dealt next (with a reasonable level of accuracy). The player’s edge is typically between 5-10%. While it may nowhere near compare to the 100%+ edge achieved by our roulette predictive devices, the edge is more than sufficient for consistent and covert winnings. The overall design and functions were designed by myself (Steve), but the devices require specialist designs that require contractors. Different versions have different developers. The V1 required the most diverse range of developers, ranging from companies that specialize in image recognition, to those focused on optical technology. Primarily contracting companies designed and built various custom components, which were then assembled by local technicians who work for us as contractors. There have been a lot of technological developments in electronics in the 10 or so years that we’ve been developing the devices.However, there is no significant difference in accuracy between versions. This is because everything that could be done to predict roulette spins was already done in earlier versions. The more soptisticated technology has mostly meant we’ve been able to make devices smaller and more covert, and with fewer components.